David Weeks is an American designer known for lighting, furniture, and household products. He has created capsule collections for Areaware, Kikkerland and Ralph Pucci International. His unique, geometric, modular and cone shaped chandeliers can be found in such famous places as Kate Spade boutiques, Barney’s New York, The Juilliard School, Saks Fifth Avenue, The MGM Grand Las Vegas and in the Brooklyn Museum of Art. Weeks is the recipient of several design awards, a graduate of the Rhode Island School of Design, and a proud Brooklynite. You have probably passed a David Weeks lighting fixture, desk lamp or lounge chair over a dozen times without even realizing it. His designs are unobtrusive and functional yet, upon further glance extremely delicate and whimsical. A custom David Weeks Torroja chandelier with black Bottle shades hangs in the dining area of a Boerum Hill, Brooklyn townhouse. Featured in Dwell magazine, February 2013 via David Weeks Studio Blog. 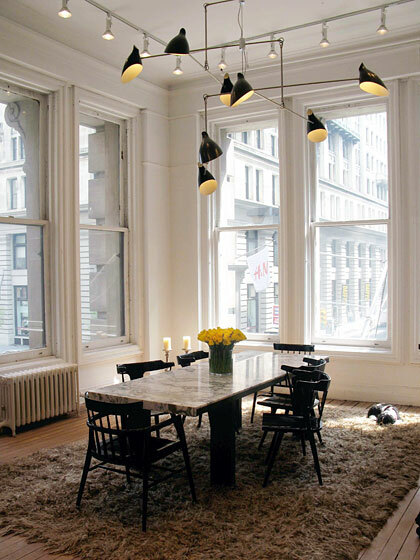 High ceilings and an open concept loft space on Fifth Avenue allow this office space with a large marble-top table modern, yet inviting. 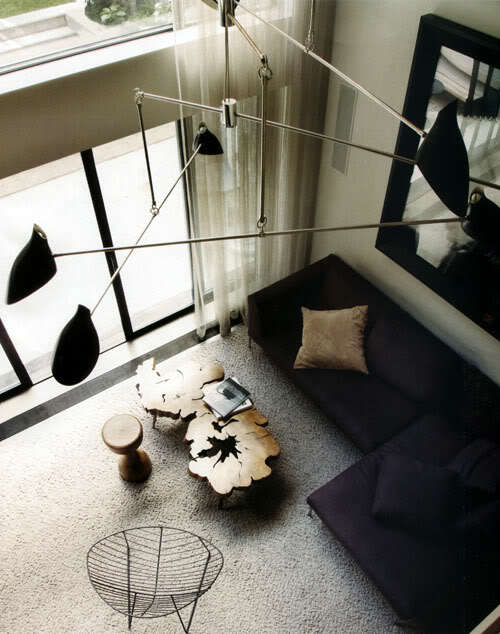 The chairs are by Paul McCobb and the hanging chandelier is by David Weeks, available at Ralph Pucci). The rug was made in Turkey from Angora-goat hair and seems ready for toes to sink into. Courtesy of Madeline Weinrib via New York Magazine. 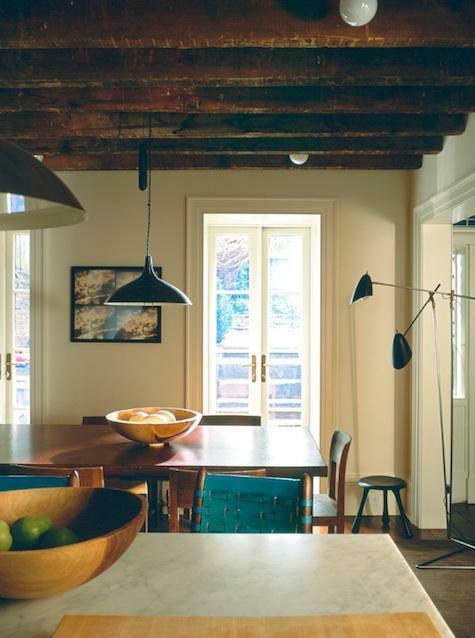 In Julianne Moore’s remodeled, West Village brownstone, a floor lamp by Brooklyn designer David Weeks illuminates a corner of the wood-centric dining area via Remodelista. The wood-beamed ceiling and high archways only add to this rustic, city meets country vibe. In the dining and living areas of a duplex loft, chandeliers by Lindsey Adelman and David Weeks accent the art collection, which includes pieces by Keith Haring, Damien Hirst, and Andy Warhol. Images of the airy Manhattan loft, with enviable views, via Interior Design. 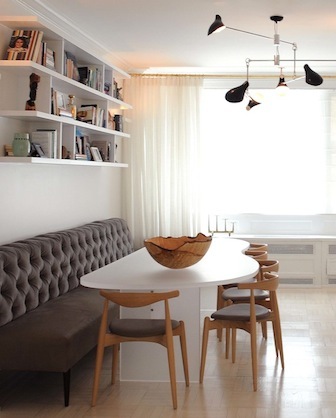 Hans Wegner’s CH20 Chair is line the table in the formal dining room of an upper east side apartment. A David Weeks light draws the eye in several diagonals and lights the space in a clever fashion. Interiors by Tori Golub Interior Design. Photography by Aaron Fedor via Suite NY. Raw wood, bare, black metal lines are accentuated by a deep purple couch, and mobile-esque presentation of the Weeks chandelier. Image found at Daily Dream Decor via Aubrey Road. Soft cream details, dark and glossy wood floors, an animal skin rug, a David Weeks fixture and bare timber ceiling beams combine to make this the perfect Aspen Mountain Retreat by Emily Summers Design Associates. A very spartan home uses a David Weeks lighting design for its visual interest found via home & interiors. 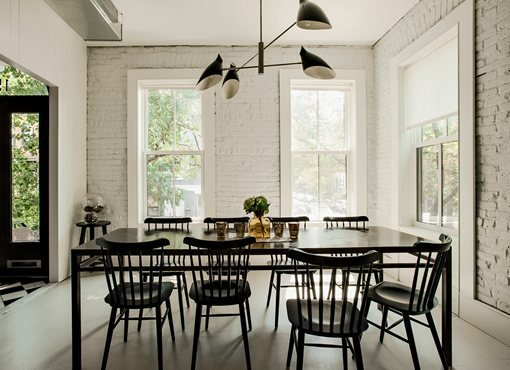 Co-founder of Remodelista, Francesca Connolly’s, Brooklyn Heights brownstone. The owner explains “I have this chaise in my bedroom covered in pale blue velvet. It’s a reproduction that Lost City Arts makes. Perfectly proportioned; lean and sleek, and surprisingly comfortable. A great spot for kids that have wondered in in the middle of the night.” See more of Francesca’s sophisticated home, featured in a past issue of Elle Decor. 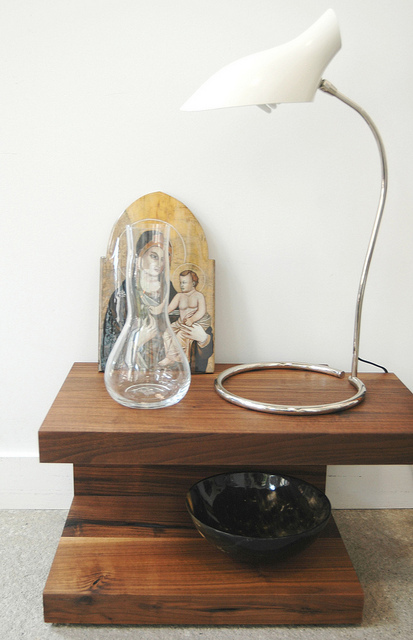 Bedside table by Christian Woo, art work by Joshua Van Dyke, lamp by David Weeks Studio (looking strangely like an alien lifeform) via Provide Home‘s Flickr. I am undecided whether the chandelier or the view is the best part. Both are pretty spectacular. A happy, mod and sixties vibe: oranges, yellows, creams and high gloss accents make this oblong living space. Do you pick up the candy or the coffee-table book first? 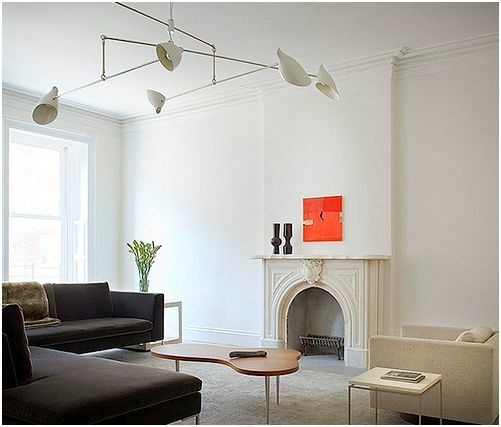 A David Weeks Studio Boi Sconce graces a room by Magdalena Keck Interior Design, NY. Photographed by Jeff Cate. Weak at the knees for Weeks! Dering Hall – The Norell Ottoman with Lucite Legs is made from bespoke vintage scarves. The epitome of glam, use this as a coffee table or a silk cushioned chair. Hidden among the legs is the designer’s signature. Williams-Sonoma – The Oval Stoneware Bread Basket looks pleasing but it also serves a clever function. Tucked inside this heated stoneware basket, baked goods stay warm at the table. It’s easy to use: Place the basket in a 350°F oven for approximately 15 minutes; line it with a cloth napkin before filling with warm breads or muffins. The thick base will continue to gently radiate heat. Jonathan Adler – The Capuchine Water Tower is made of stripes of matte cream poured over unglazed brown clay. The studip’s pottery begins its life in a Soho studio, where Jonathan and his team design and sculpt every prototype. Yet, the product you are viewing is produced by skilled artisans at his main workshop in Peru! Rainbow Darkness – The POW Comic Book Expression Post Earrings are the perfect gift for any geek chic girl who has a passion for super heroes! Remember those dorky yet awesome Adam West batman shows from the sixties? These earrings get the vibe perfectly. Superette – The Tosca & Salome Skull Candle in pink is a strikingly morbid yet effeminate display. I only imagine it becoming creepier as the wax melts over the eye sockets. 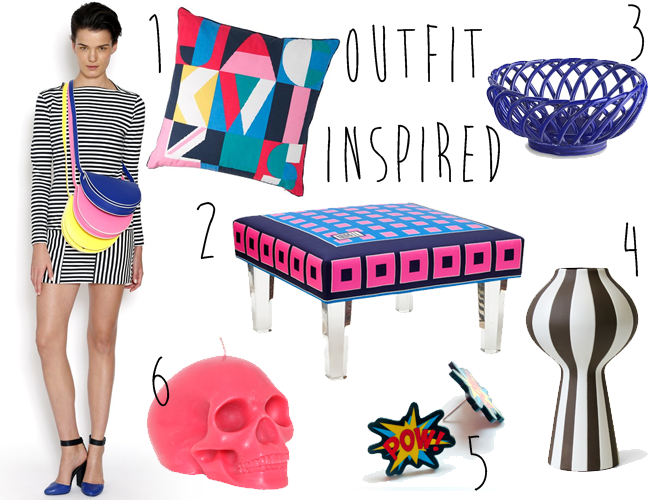 The Prabal Gurung for Target collaboration is a huge success. Armed with a bright arsenal of spring ready looks, the aptly named LOVE collection feels like a flutter of delicate butterfly kisses on one’s cheek. Saccharine but hip. 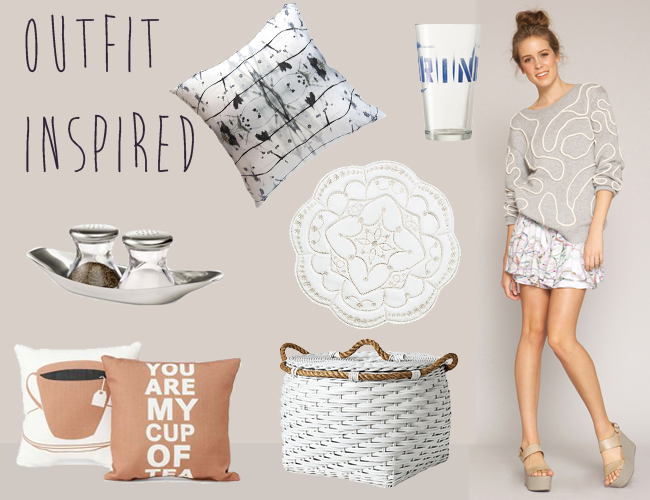 “This collection was inspired by love, and if Target’s guests can feel even a little bit of the love that I felt while designing this collection, then I will consider it a job well done,” said Gurung. Can you feel the amore? Crate & Barrel – The Kuhn Rikon Green Y Peeler combines the elegance of Scandinavian Design with the irrelevant joy of pistachio green. You can’t “peel” yourself away. Macy’s – The butter LONDON Sweetie Shop Collection is inspired by the charming colors and silhouettes of the 50’s era. Shades influenced by soft pastels of cotton candy, milkshakes, and macaroons enhance its playful feminine edge. A brilliant sherbet, luxe lemon, and peppy violet are paired with an icy mint, a rich candy pink and a creamy khaki for a statement that’s sweet but chic. 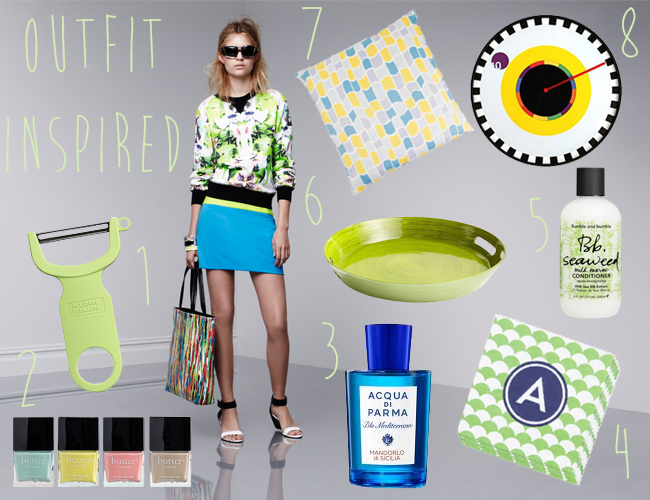 Saks Fifth Avenue – Acqua di Parma Blu Mediterraneo instills one with the elegance of Italian style. The top notes bring the touches of Sicily with sweet freshness of bergamot, united with Frangipani flower, orange blossom, green almond, and star anise. The heart introduces the notes of white peach, coffee grains and white jasmine. The base is composed of velvety and powdery Bourbon vanilla, light musk, cedar and milky warm sandal wood. Notes of orange blend with green Mediterranean almond and ylang-ylang. The base notes blend cedar wood, vanilla, and white musk. Swim in it. C Wonder – These Monogram Paper Napkins give your table a personal touch with a cheerful monogrammed cocktail napkins, designed in a bright array of patterns. The party-perfect set of 20 paper napkins makes every toast even more fun! Bloomingdale’s – Bumble and bumble Seaweed Conditioner is a lightweight detangler made with marine seaweed and spirulina. Marine greens are practically ideal for frequent bathers. It Gently detangles, nourishes, softens, and helps to manage freshly-washed hair. The lovely branding doesn’t hurt either. Pier 1 Imports – Bamboo Tray in Citron Green. I am still amazed at what Vietnamese artisans can do with bamboo. In this case, they’ve spun bamboo fibers into a serving tray complete with handles, then hand-painted it with a brilliant, glossy green finish. The result is very strong, very light and very beautiful. HORNE – The Marigny Pillow in Atmosphere incorporates colors drawn from the architecture of New Orleans, Marigny is an homage to a vibrant city with a rhythm all its own. Kimberly Lewis pillows are printed on cotton twill made in New York City. MoMA Design Store – The Sprocket Wall Clock is from the celebrated graphic designer Milton Glaser, whose I ♥ NY rebus is in the MoMA collection, this ultra-thin plastic wall clock, with both a number and a color spectrum, displays time in an unconventional way. A rotating disk with a circular hole reveals the hour, while the red hand denotes minutes. Joe Fresh – Slim Print Pant. The lynchpin of the entire psychedelic, English garden inspired fete. YLiving – The Hang Planter is a sleek little vessel whose cylindrical shape and sharp slant opening create a cozy and protective environment for a variety of your green, prickly, or floral friends at lofty heights. Wallter planters are made from spun aluminum and powder coated with vibrant color finishes, elevating your gardens to new levels with a fresh pop of color. 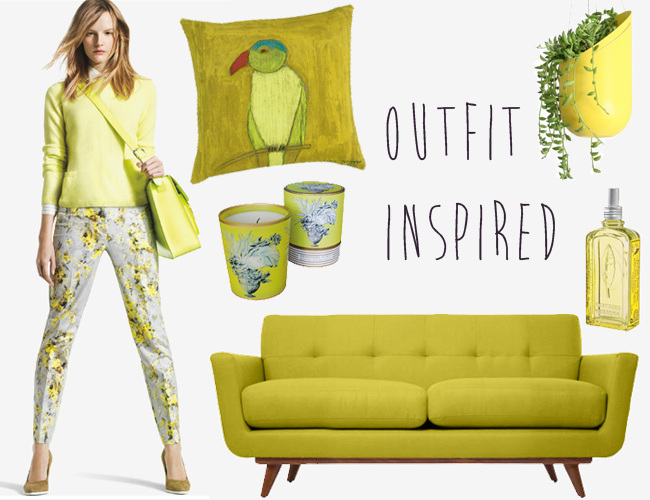 CB2 – Parrot Pillow. Tropical bird comes in for a landing from our friends at San Francisco’s Creativity Explored, a nonprofit visual arts center where artists with developmental disabilities create, exhibit and sell art. Originally a mixed media on paper, artist Lien Nguyen perches her parrot with vivid expression in bright shades of chartreuse, red and blue with a painterly touch that evokes the ethereal qualities of her medium and method. Designer’s Guild – Zephirine large scented candle. A subtle blend of citrus green tea and sparkling bergamot heart and an amber base. Burning time 50 hours. L’Occitane – Citrus Summer Fragrance. Enriched with organic verbena from Corsica, lemon oil from Sicily and grapefruit extract from Italy, this new summer fragrance tones and leaves the skin scented with an invigorating and fruity fragrance. Thrive Furniture – The Nixon loveseat, in Klein Wheatgrass, embodies all the design elements that the Scandinavian architects of the 1950s valued. It’s small, intimate, and offers more options in terms of configuration. Swedish apartments back then were really small and loveseats were more appealing than full-sized sofas. Whitney Eve, created by Whitney Port of The Hills and The City fame, has a fashion line that is equal parts eclectic and feminine. Whitney Eve evokes a girly nature with a touch of sass that is unique with custom prints created by the designer season after season. This outfit, from the Fall 2012 Look Book, is muted yet punchy. Century 21 – THRO BY MARLO LORENZ Set of 2, Cup of Tea Throw Pillows. High contrast graphic design meets earth tones. Museum of Modern Art Design Store – Salt and Pepper Shakers by Wilhelm Wagenfeld, 1952-3. A midcentury design featured in the Museum’s collection, these iconic petite salt and pepper shakers are complemented with a stainless-steel tray which makes for easy transport. Juliska – From the Jardins du Monde Collection- reminiscent of unfurling layers of petals, this charger is a veritable stroll through the gardens of the Grand Tour, where enlightened 17th century minds triumphed over nature with precise geometrical patterns that now flourish on the modern table. Stunning when used as an hors d’oeuvre platter, or adds drama to your table setting as a charger. Serena & Lily – Rope Bin Collection in White. Woven by hand of squared-off rattan with a thick jute rope wrapped around the top, these rugged bins are easy to tote from playroom to bedroom to laundry room. Target – TOO by Blu Dot Tagged Pint Glass Set of 4. The TOO line is designed for small urban spaces, and features modern Eames-like pieces with graffiti and other trompe l’oeil effects. Drink up! Eskayel – Splatter Spell – Granite 24″x24″ pillow, like resting your noggin on a Rorschach test.